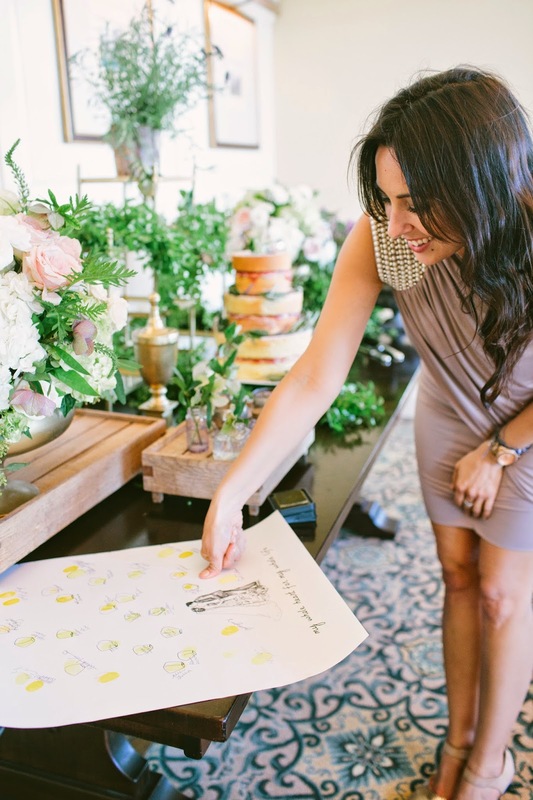 We loved this Southern California wedding with its perfect summer palette! 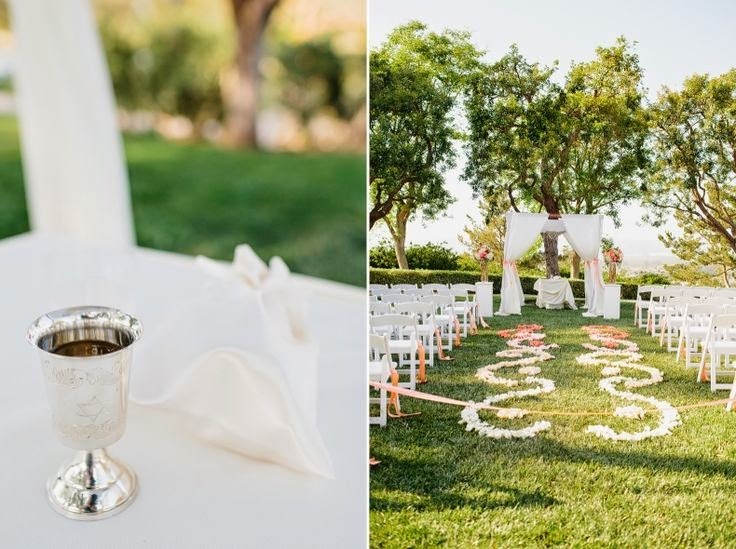 Elizabeth and Andy celebrated with an outdoor event at the beautiful Spanish Hills Country Club. 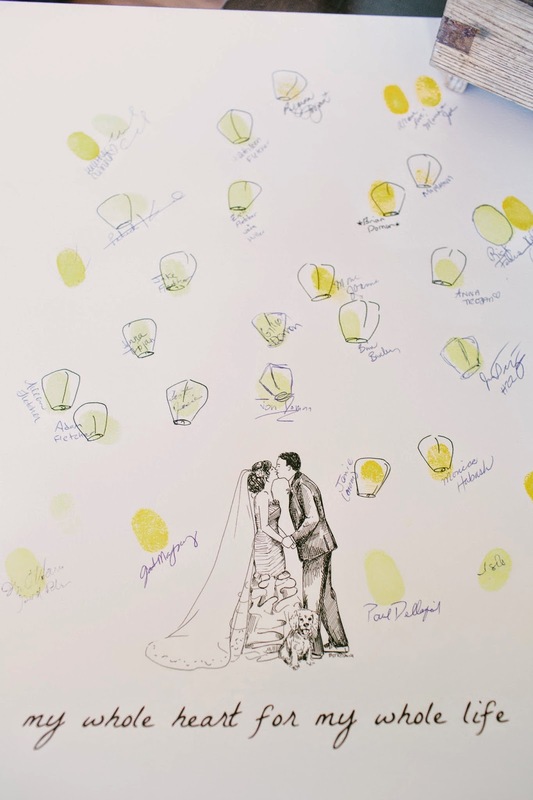 For their Bleu de Toi guestbook, they chose the Elm Tree with ink colors in "Mowed Lawn Green" and "Worn Lipstick Pink"--very fitting for their green grass and coral wedding colors. 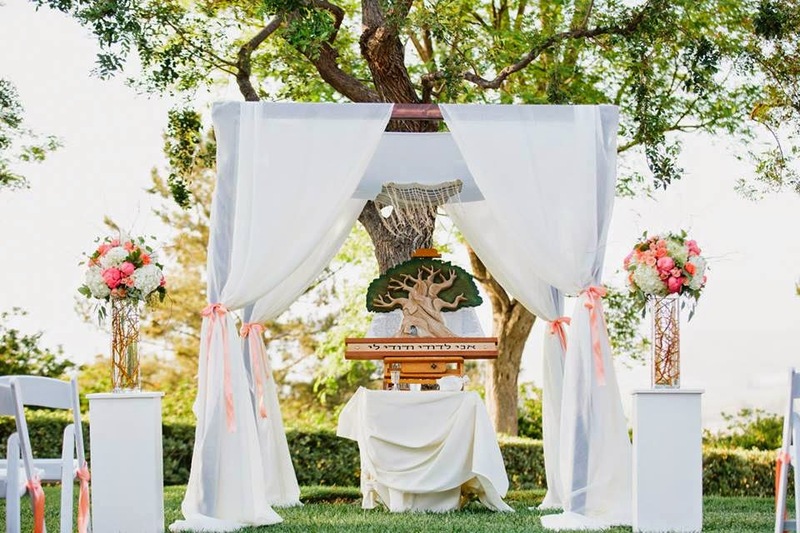 In their Jewish ceremony, Andy and Elizabeth incorporated some particularly meaningful traditions: we were especially in awe of the gorgeous wooden tree that awaited them under their chuppah (the wedding canopy). 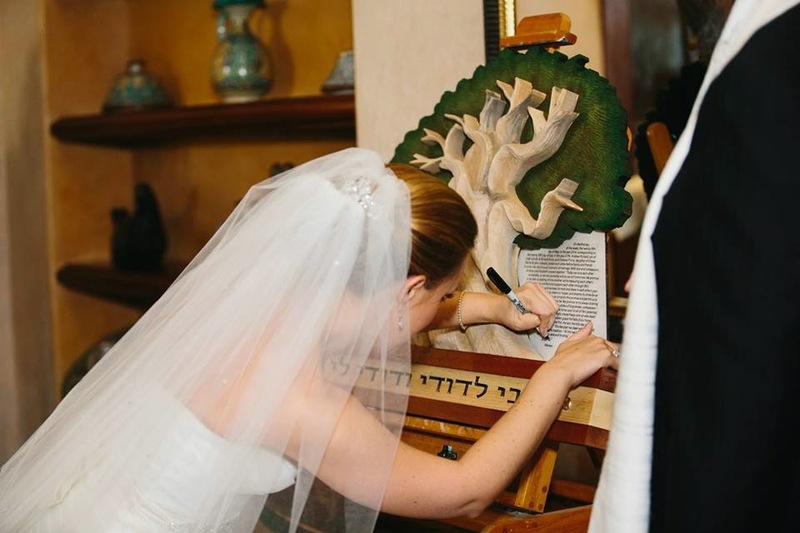 Per Jewish tradition, a couple signs a "ketubah"-- a wedding contract that includes commitments the couple intend to make towards one another. In modern weddings, ketubahs are often one-of-a-kind pieces of art that will later hang in the couple's home. 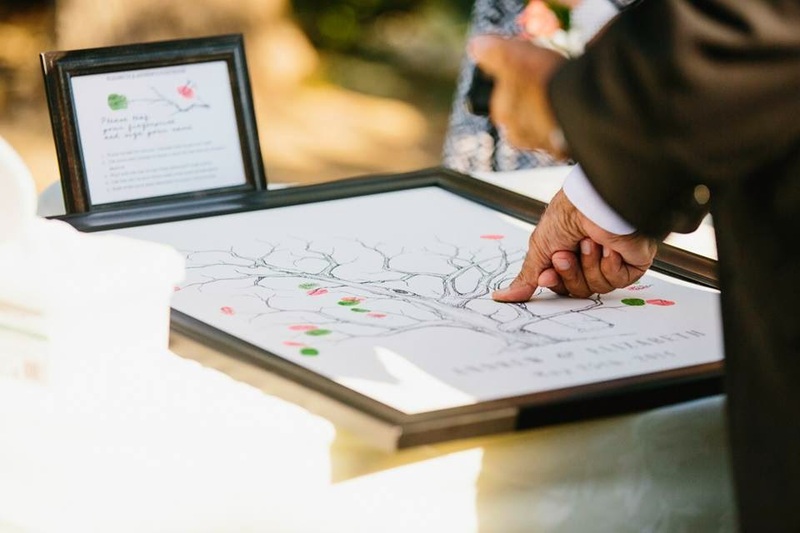 How special that Elizabeth and Andy will have two different trees to showcase their union: one that portrays their commitment to each other, and one that displays their friends' and family's commitment to them. 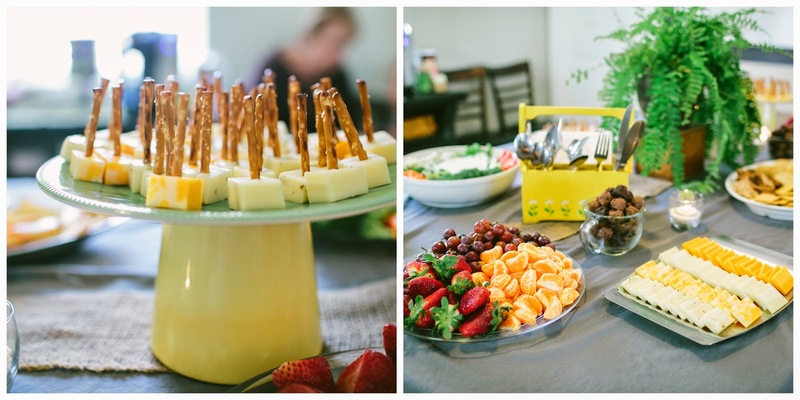 For more pictures of Elizabeth and Andy's wedding, see the post at Marianne Wilson Photography. 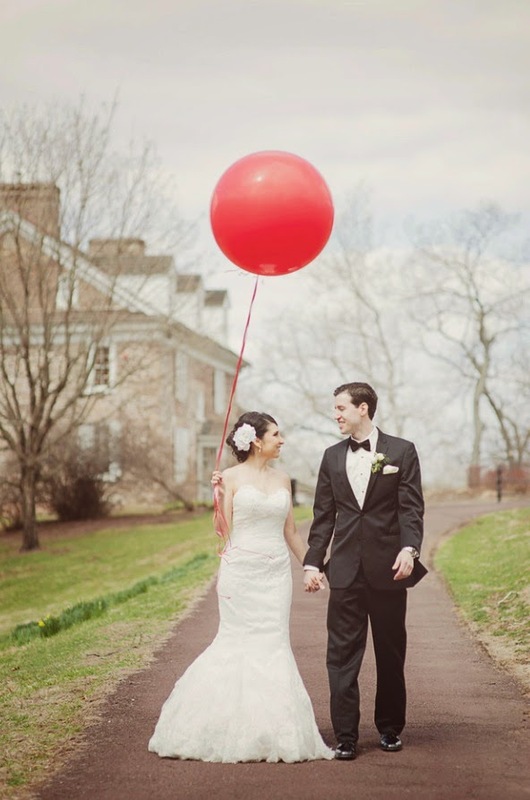 Aileen and Adam celebrated their wedding with two events on two coasts, and incorporated a giant red balloon into both their ceremonies: Adam's grandmother could not make the flight out to California for the wedding, so the couple hosted an intimate family ceremony at a restaurant in Pennsylvania that his grandmother could attend. The balloon showed up at both ceremonies, and its presence at the California wedding symbolized the attendance of Adam's grandmother. Adam and Aileen also chose lovely vintage elements for their beach wedding in California at the Montage Hotel--we particularly love their picture with the antique bicycle, the sprigs of lavender in Aileen's bouquet, and the gorgeous floral bridesmaid robes. 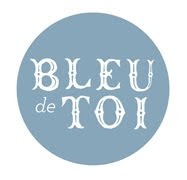 For their Bleu de Toi guestbook (present at both events! ), Aileen and Adam chose the Custom Couple Wish Lantern. We added some personal elements to their design, including a drawing of their sweet cocker spaniel who passed away a month before the wedding. 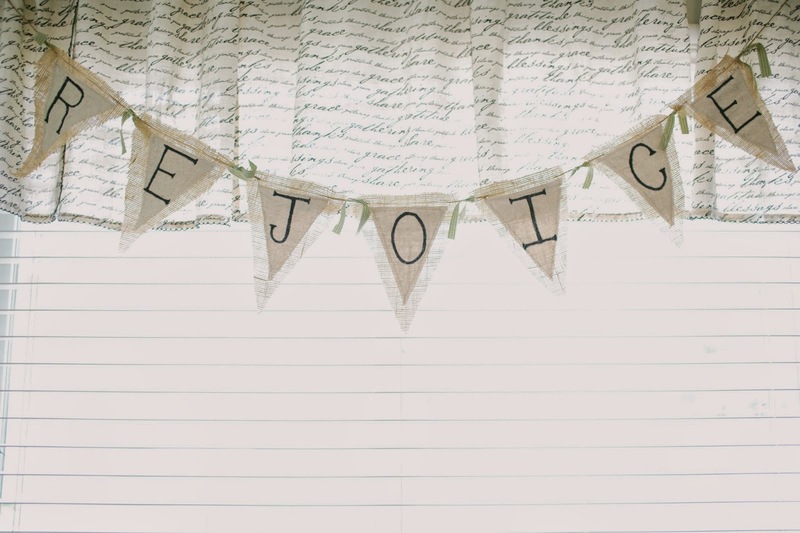 We were so glad to be part of this special day! A special thank you to Maria Mack Photography for the pictures of the Pennsylvania event. For more pictures of Aileen and Adam's Laguna wedding, see Rob and Lea's blog posts at Vis Photography. 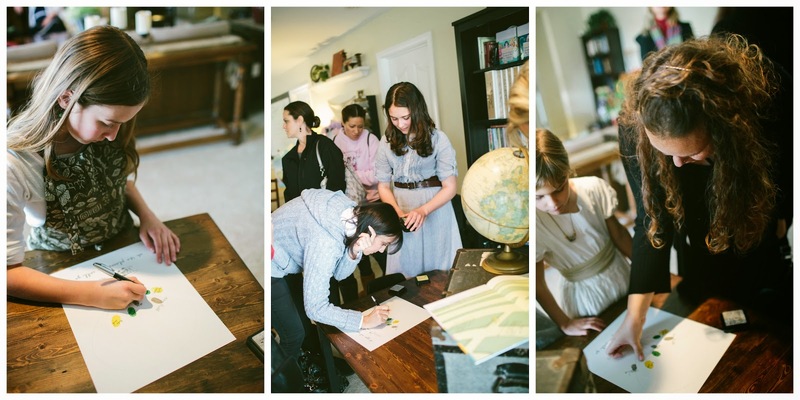 Kim's baby shower used a beautiful, old-world travel theme that worked perfectly with our Prop Plane balloon guestbook. 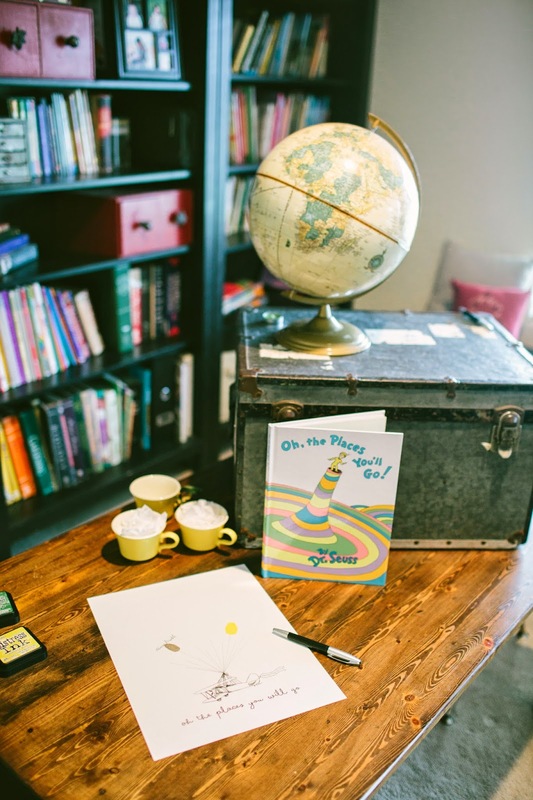 We love, love, love the antique-style trunk and globe that adorned her signing table. 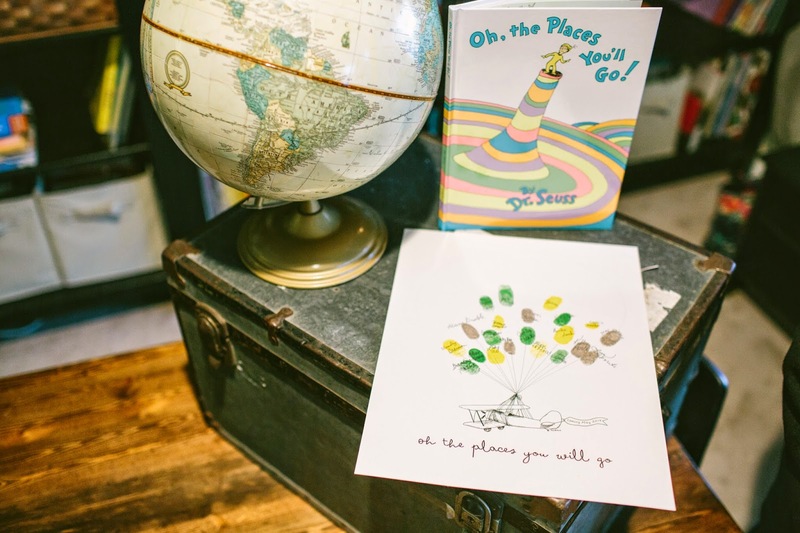 Paired with Dr. Seuss's Oh, the Places You'll Go!, they gave the party an air of adventure and possibility! 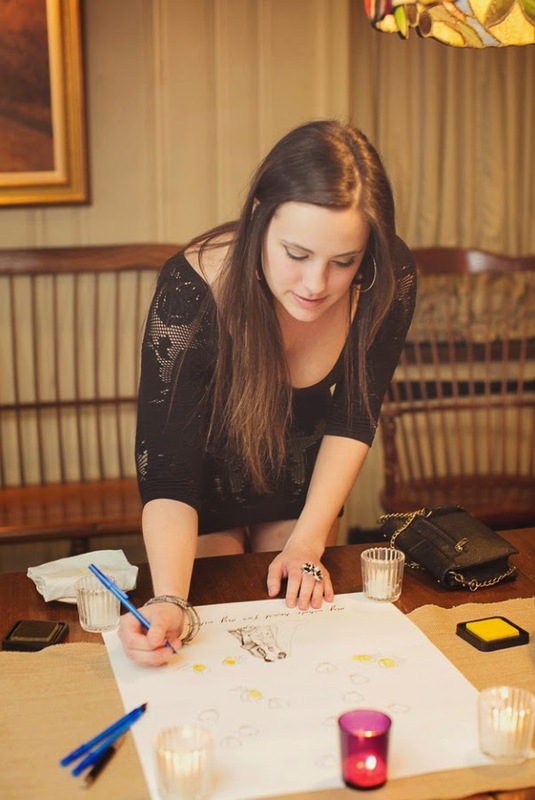 Kim's guestbook is a great example of how a Bleu de Toi piece can be specifically adapted for an event. 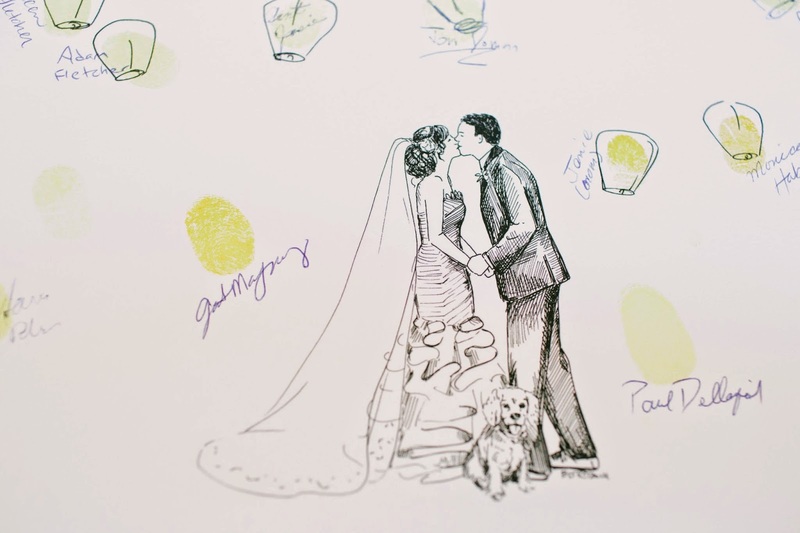 First, Kim chose ink colors that matched her old-world decor (Mowed Lawn Green, Mustard Seed Yellow, and Pumice Stone Grey.) 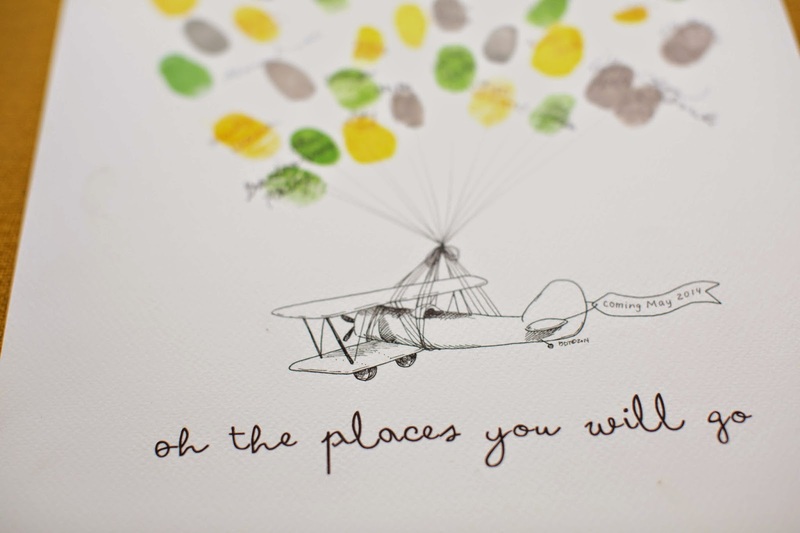 Her custom text says, "oh, the places you will go" in the "Playful" font, perfect for baby. The Prop Plane guestbook was originally designed as a wedding guestbook (with a two-seat plane, and a "Just Married" sign flying off the tail). For Kim, we made the plane a single-seater and adjusted the tail sign to say "Coming May 2014". 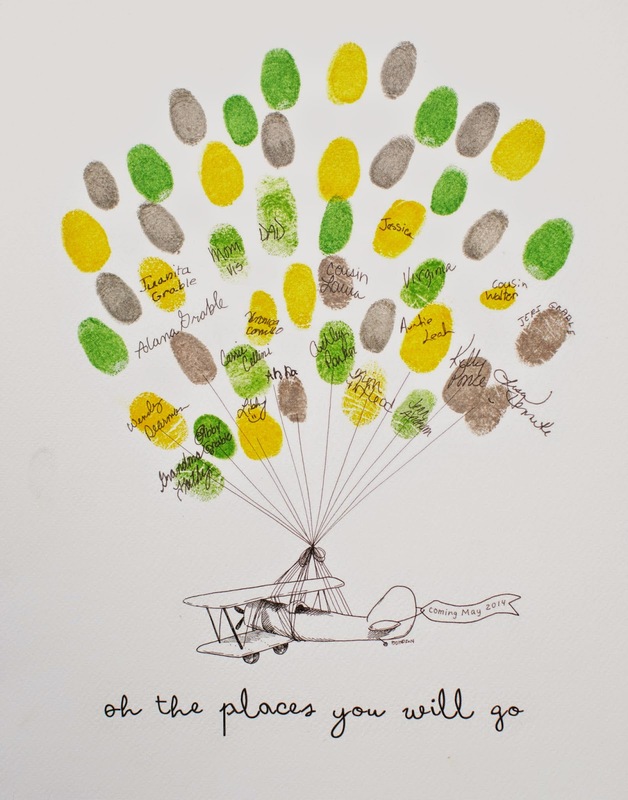 If you wanted the same adjustments for your Prop Plane guestbook, just ask to make the piece "baby-shower appropriate" during check-out on our website. Keep in mind, we can always add additional details like baby initials or a decorative element on the tail. Congratulations to Kim on her gorgeous baby shower and her joyful new arrival! Oh, the places he'll go! Photos from the talented Lea Vis of Vis Photography.